General view from the south west. Original negative captioned: 'Louden Wood Circle, Pitfour near Mintlaw, view from S.W. 1907'. 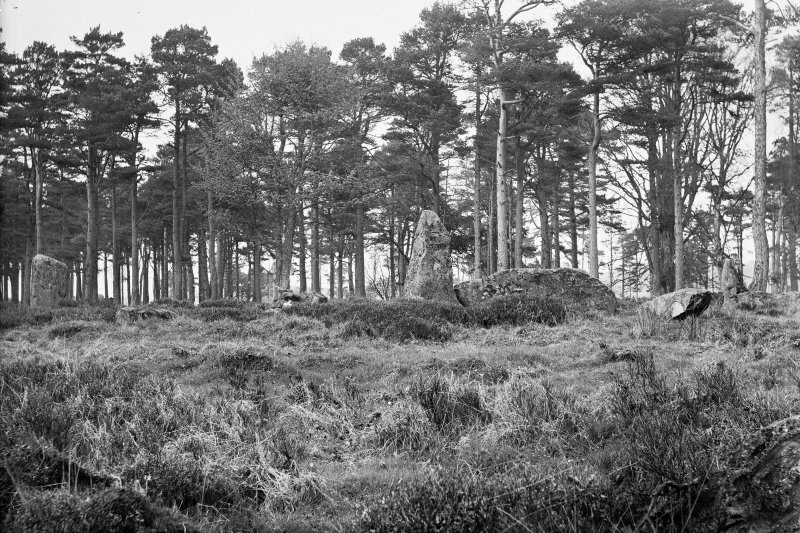 Photograph of recumbent stone circle at Louden Wood, taken from NE. Titled: "Louden Wood. Recumbent Stone and Flanker". Oblique aerial view centred on the remains of the recumbent stone circle, taken from the NNW. 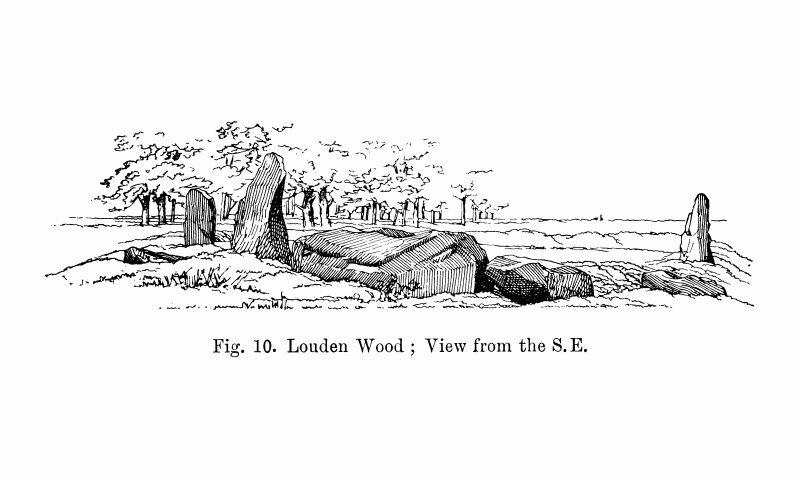 Loudon Wood, Pitfour Circle: Four stones, including the recumbent stone and its west side stone, still stand in situ and three others have fallen. 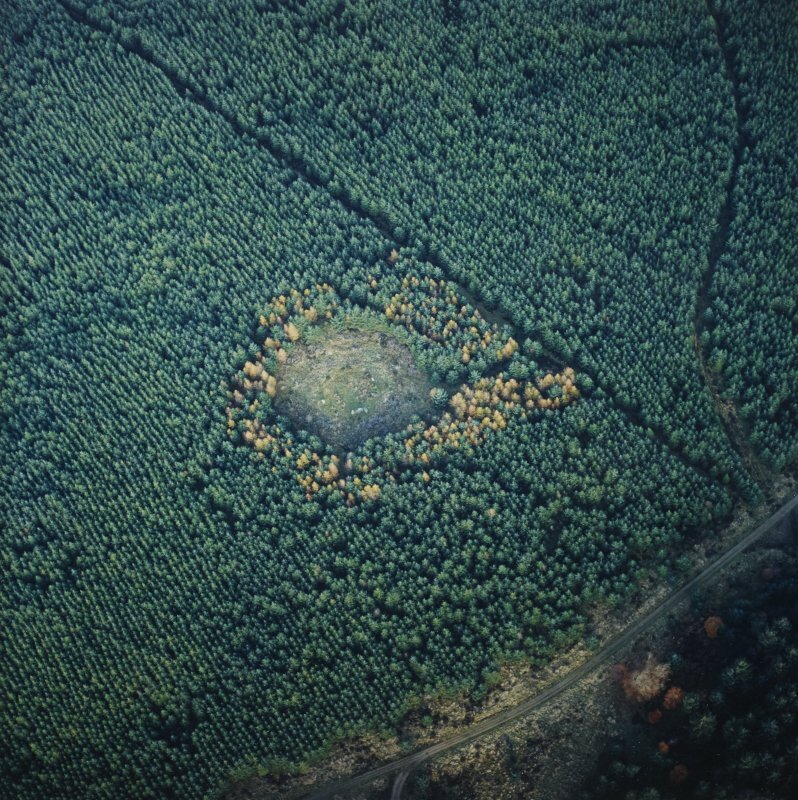 These remains of the circle indicate a diameter of about 64ft. 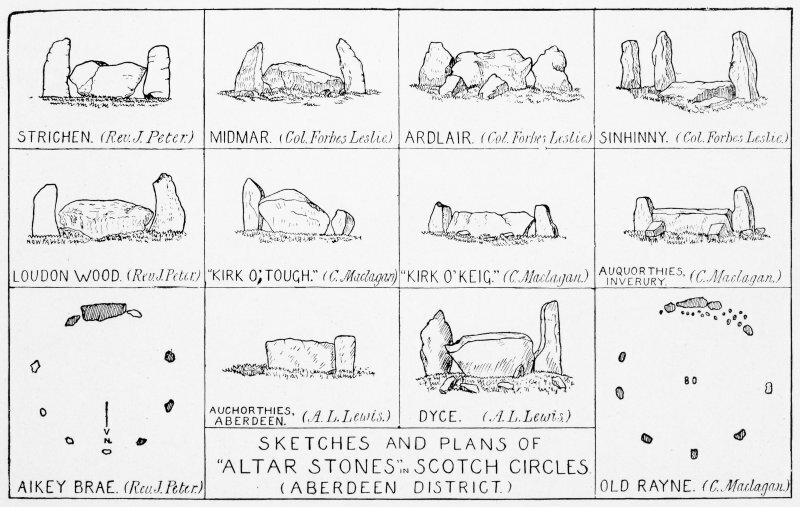 Recumbent stone circle, as described above. 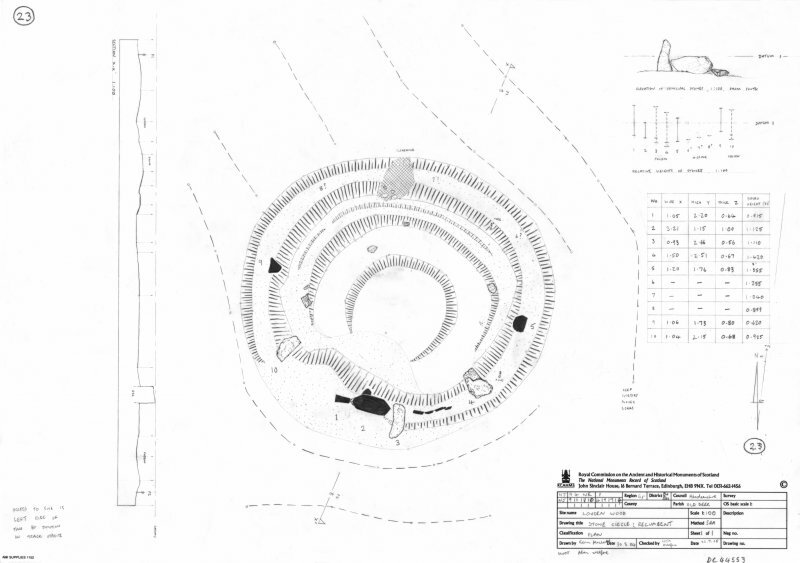 The stones are set upon a bank 18.5m in diameter from crest to crest and about 0.8m above the interior. Visited by OS (RL) 5 April 1968. Air photographs: AAS/97/13/G28/23-6 and AAS/97/13/CT. Positioned near the top of a long hill slope, its outlook masked until recently by mature, closely set conifers, this is a classic Buchan variant of the recumbent stone circle, having a bank, 0.8m high, on to which the standing stones had been dragged and levered into position. Unlike Strichen (no. 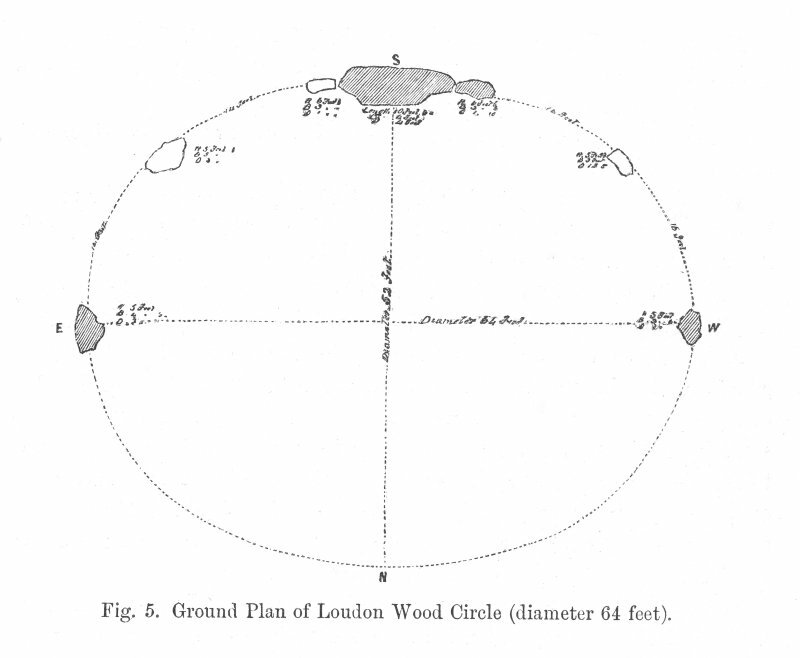 93) but similar to Netherton (NK 043572) and Aiky Brae (N] 958470), this is circular in plan, being 17.6m in diameter. Although only the lichen-encrusted recumbent, west flanker and two other stones remain standing, this green, mossy, circle is still an unearthly spot. The 12-ton recumbent would have required at least 40 adults to pull it up the slope. 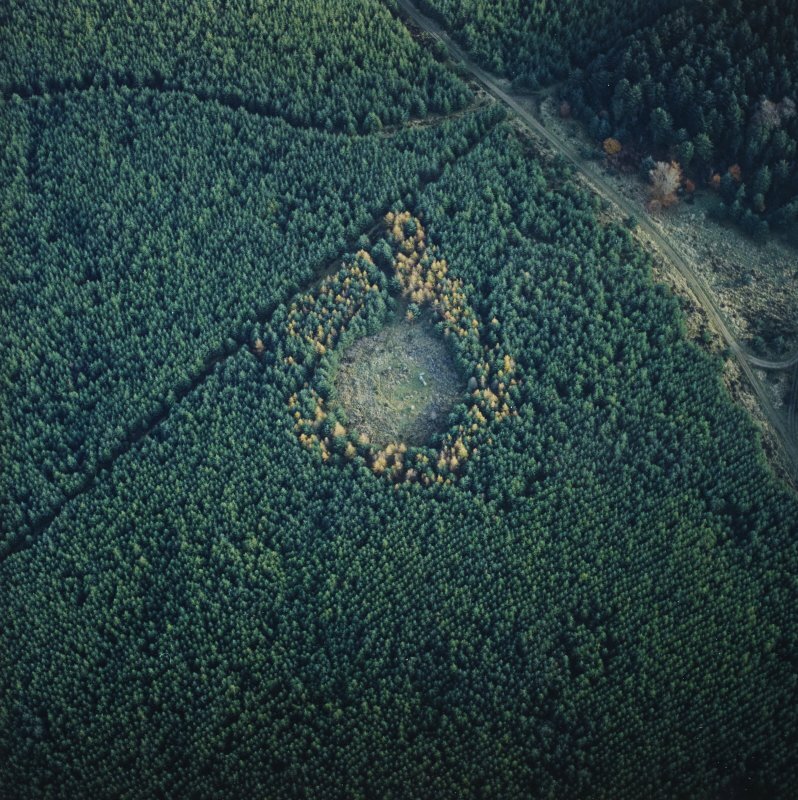 This recumbent stone circle is situated in a grass-grown clearing amongst the conifers of Loudon Wood. 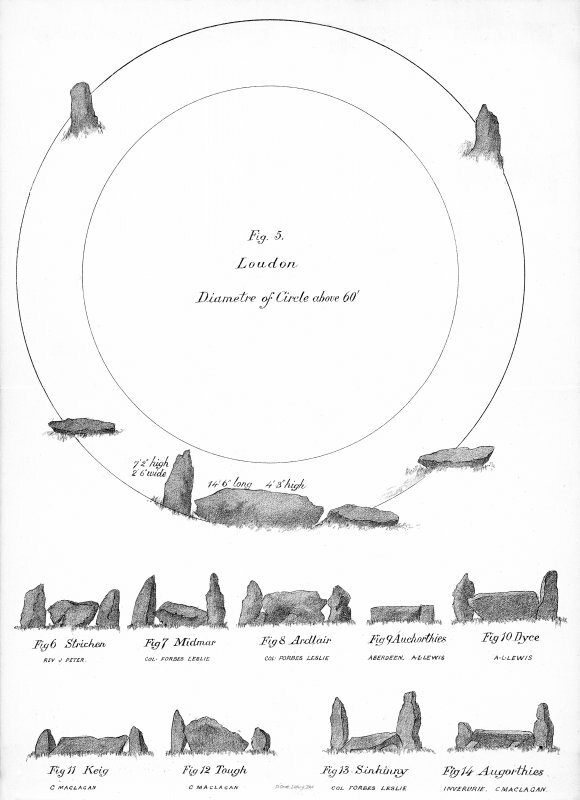 It now comprises the recumbent setting and only four orthostats, two of which are fallen (4 & 7), set around the southern half of an oval ring-bank measuring 23m from ESE to WNW by about 20m transversely overall; formerly there were probably another three or four stones around the N. The orthostats evidently stood along the inner edge of the ring-bank and the circle itself measures only 19.6m by about 17.5m overall. 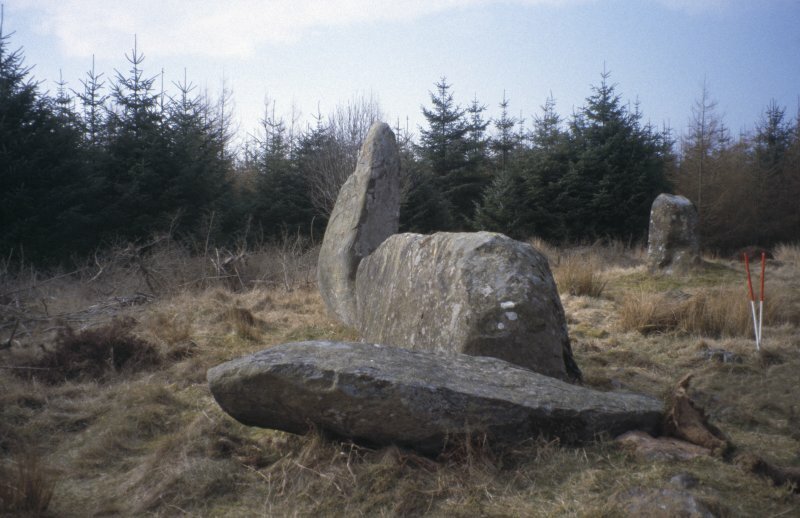 The recumbent (2), which lies on the SSW, measures 3.2m in length by up to 1.15m in height and a stone sleeper can be seen beneath the back of its W end. The relatively even summit of the recumbent dips at its W end towards the adjacent flanker, and a possible cupmark can be seen a little W of its highest point. The W flanker (1) stands some 2.2m in height and arcs over the W end of the recumbent, while its fallen pair on the E (3) is evidently of similar size and shape. The foot of the W flanker is roughly aligned with the front of the recumbent to extend the long axis of the setting. Despite the fallen and missing stones, the heights of the orthostats appear to have been graded, with the tallest occurring on the S. The stony ring-bank in which the orthostats stand measures up to 3.5m in thickness by 0.4m in height, and the tops of a row of kerbstones can be seen protruding through its crest immediately E of the fallen E flanker. 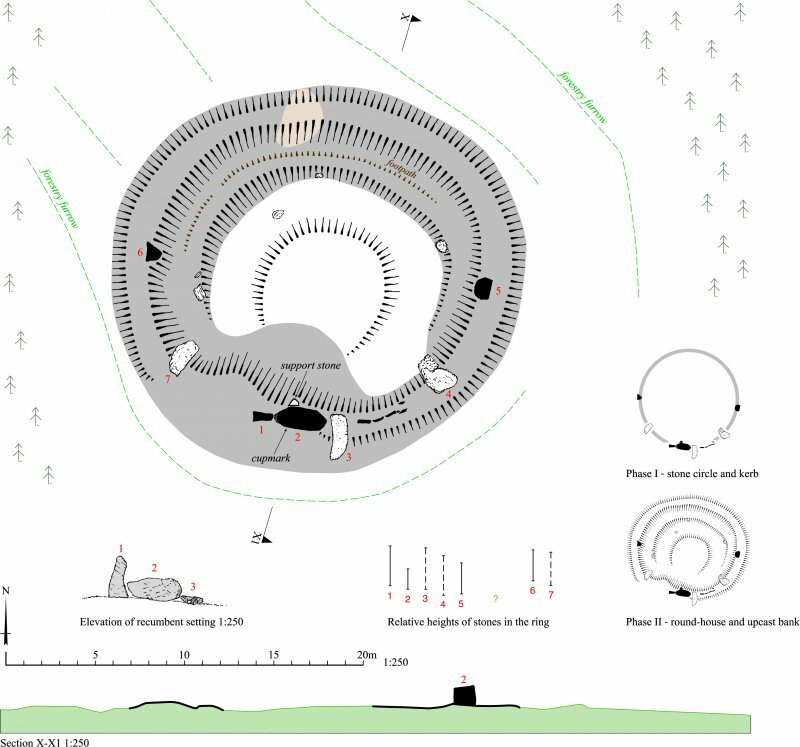 In its present form the ring-bank is more substantial than is usually found in Buchan rings (eg Aikey Brae, No. 1), but it is likely that these stones belong to the outer kerb, which was subsequently encased within a thicker bank when the interior was dug out to provide the stance for a later timber round-house. 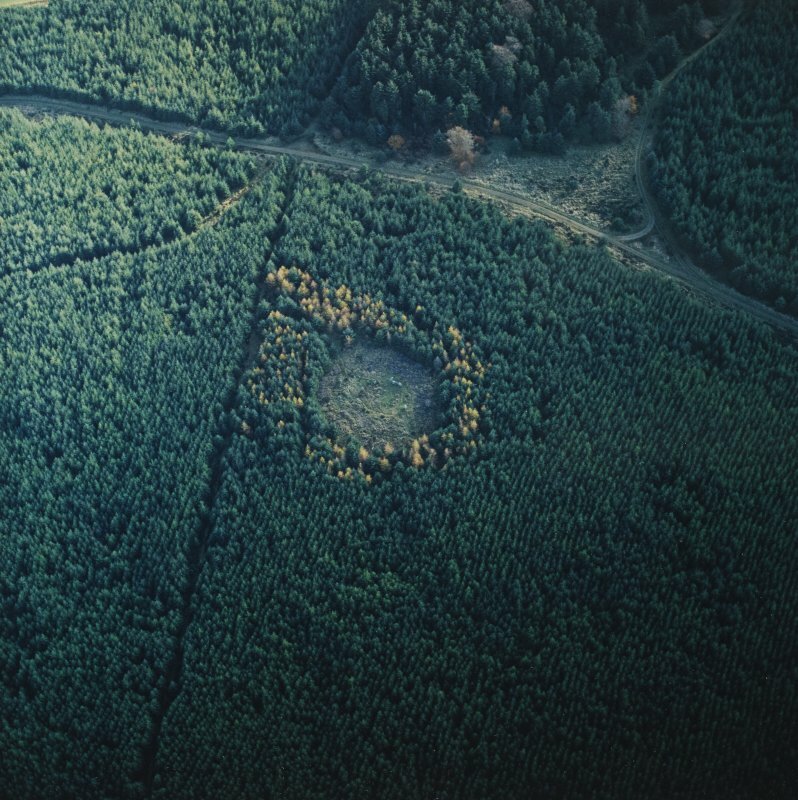 Evidence of this later occupation is provided by a shallow ring-ditch measuring about 13.5m in diameter, which lies concentrically within the bank (cf Strichen House, No. 62); its entrance is probably on the SW at a heavily degraded sector of the ring-bank immediately W of the recumbent setting.